WayRay, a resident startup of the Skolkovo Foundation’s space cluster that makes holographic augmented reality displays for cars, has raised $80 million in a Series C investment round led by Porsche. WayRay's technology projects additional information into the driver's field of vision. Photo: WayRay. The other investors in the round were Hyundai Motor, Alibaba Group, China Merchants Capital, Japan’s JVCKENWOOD and a consortium of sovereign wealth funds. WayRay plans to use the funds to expand its team and establish an affiliate with a pilot production line in Germany, with the end goal of supplying its holographic AR solutions to car manufacturers, the company said in a press release. WayRay’s AR solutions comprise advanced driver-assistance systems, route-related information, notifications and points of interest for drivers, all of which are projected into the driver’s field of vision, as well as personalised contextual information for passengers and infotainment for self-driving cars. The Zurich-headquartered startup, which conducts much of its R&D and prototyping in Moscow and opened an office at the Alibaba Innovation Center in Shanghai earlier this year, has raised more than $100 million since its launch in 2012 and aims to become a unicorn with a value of $1 billion by the end of 2019, after it launches sales of its products. China’s AliBaba already invested in WayRay last year, leading a Series B round that raised $18 million for the startup. The new investment will help to diversify the company’s portfolio of applications in different sectors, from AR in transportation to AR smart glass in the smart home business and construction industry, WayRay said, adding that it now plans to make the transition from startup to scale-up. WayRay CEO Vitaly Ponomarev, left, with Porsche's deputy chairman Lutz Meschke. Photo: WayRay. “As a deep-tech company, we are committed to creating fundamental innovations that bring us far beyond holographic AR displays and new interfaces,” said Vitaly Ponomarev, CEO of WayRay. Porsche first joined forces with WayRay for a pilot project at Startup Autobahn, Europe’s biggest platform for automotive innovation. “The WayRay team has unique expertise with a solid background in space engineering, hardware and software development,” said Lutz Meschke, deputy chairman of the executive board and member of the executive board for finance and IT at Porsche. “Their innovative ideas and products have great potential. We are convinced that on this basis we’ll be able to offer our clients customized Porsche solutions. That is why we have made this strategic investment decision,” he added. 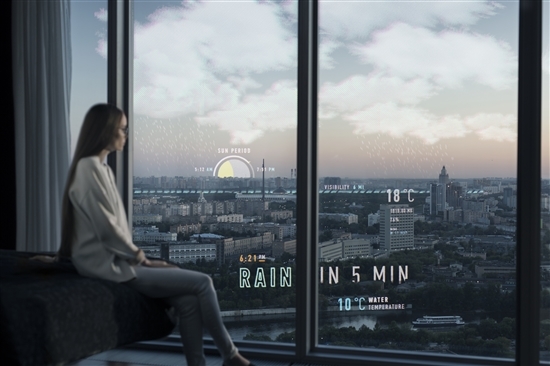 WayRay is looking into other uses for its technology, such as in smart glass home solutions. Photo: WayRay. WayRay has developed an AR navigation system called Navion in which directions are shown on the windshield in a transparent holographic display, meaning the driver does not have to take their eyes off the road to look at the navigation system display. It is also working on another product, Element: a compact dongle that works with an app to give drivers feedback on their driving. Described by the company as “a personal driving coach,” Element compiles statistics on the driver’s performance with the aim of helping the driver to improve. 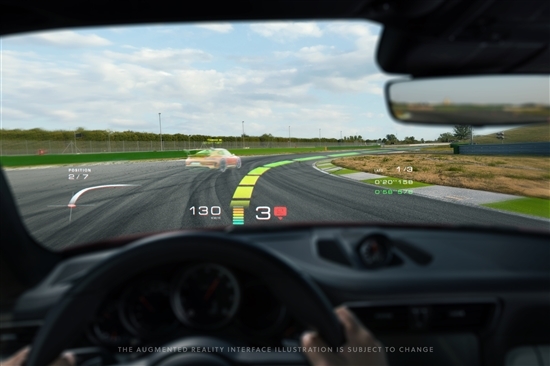 WayRay’s holographic projection system can be installed in almost any car model, and its wide field of view displays more virtual objects at a comfortable distance for drivers’ eyes than conventional HUDs (head-up displays) available on the market, the company claims.